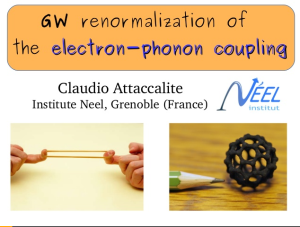 My new presentation on the “GW renormalization of the electron-phonon coupling” is available online. This is the talk I gave to the “Correlation Meeting 2014” organized by Pina Romaniello. In this presentation I show that GW corrections are important not only for band structure and energy levels but they also renormalise the electron-phonon matrix elements. This re-normalisation is import to reproduce Raman, superconductivity, temperature dependence of the band gap and so on.